Don’t wait for consignments: Seek them in the classifieds of your local newspaper! Like Star Coin and Currency, EBW Coin not only showcases its coins but also its Internet friendly service terms that include ZERO percent buyer’s fees. How does EBW do it? We’ll explain how you can, too. There’s no question that Proxibidders like low buyer’s fees. EBW Coins sells at zero! It’s not surprising, however. The company has a Wilmington, Mass., office that schedules appointments for anyone with coins to sell. They buy those coins so they don’t have to pay buyer’s fees. If you’re a typical auctioneer, you may be waiting for consignors to come to you. Or perhaps are not advertising sufficiently to buy estates. However, by placing an advertisement at least once per month in your local newspaper, inviting families with coins to sell to come to your office, you can score a major consignment, lower your buyer’s premiums and compete online with veterans like EBW Coin. 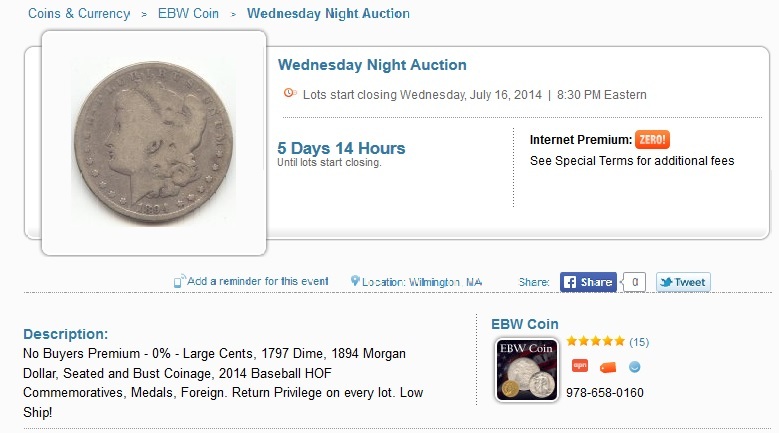 This entry was posted in Best Practices and tagged AuctionZip, EBW Coin, iCollector, National Auctioneers Association, Proxibid, Proxiblog. Bookmark the permalink.